A couple of years ago, the thought of making a video and letting people hear me talk would have been unthinkable. But the desire to teach art and help people become more creative and happy in their life’s journey has become so strong, that I have gotten over it. It’s much more fun than I thought and not nearly as frightening. Sometimes it feels a little odd to sit in my craft room and not talk to anyone but myself. It would be so much more fun to have a bunch of you in my craft room instead. We could chat, sip on wine, make a mess and laugh, laugh, laugh! I have been having so much fun making lots of videos for my e-course that I wanted to share one here too. You won’t hear me talking in this one, but don’t be surprised if you see a video tutorial over here in the near future. It is so much easier to explain how to make something without having to write every detail. 21 Responses to Watch me paint! I loved watching you paint! So inspirational! GORGEOUS painting you did! That was one of the most amazing things I’ve ever watched. I LOVE this – so incredible to see all of the layers that go into your painting. VERY cool! I had so much fun watching you paint! I loved that you went with one idea then decided you wanted something else so you just painted over the original idea (like the stars). Makes me feel like I am being to hard on myself when I get brave enough to dabble in painting. Thanks for sharing your video. I love to watch people painting, it is so much fun to see the progression and then the final painting. I’m so glad you “discovered” videos, because it is fabulous watching you work. This was a great video. I have so many questions to ask! Watching the video running fast without audio was inspirational. I kept thinking “Just do it. Don’t think so much.” I look forward to visiting your site in the future and learning a lot from you. I also loved the ‘Juno’ music. It’s one of my favorite movies and characters. this was so fun to watch! little bit mesmerizing, a little bit relaxing and a lot inspiring. I loved watching you paint! I always love seeing other people’s process, so much fun! Awesome! Loved it! Question for you…did you think through the central concept before you began? 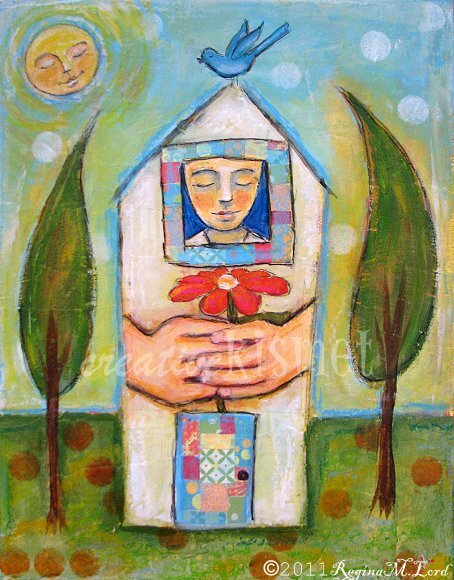 Like, did you know you wanted to have the person in the house with hands holding a flower before you began? Or did it just evolve as you went along? LOVE it girl! you are so talented! there’s just something about your color choices that i absolutely adore. That was so wonderful and beautiful! Thank you so much for sharing! Thank you! I loved watching this. I love the little bird on top – much better than the original stars. I love this! I have been obsessed with watching videos of artist doing paintings ever since I starting trying to paint. It fascinates me to see where each piece goes and what goes on first, then next, etc.. I love the piece, its beautiful! That was an AWESOME video! so much fun to watch you paint! i want to buy your craft, but i live in Brazil. How we can do? told to me by e-mail?